Mr. Trump, show us that you aren’t Mr. Obama – Центр "Нова Європа"
Since being elected president, Donald Trump has repeatedly blamed his predecessor for the annexation of Crimea by Russia, saying that Barack Obama’s soft policies allowed Vladimir Putin to take over the Ukrainian peninsula. Now the opportunity has arrived for the US president to show that he’s not President Obama. He has a chance to give a master class in how to respond when Putin wants to get aggressive against countries that are strategic partners of the United States of America. This opportunity has come up since Russia de facto opened a marine front in addition to its land war against Ukraine. Over the weekend, Russian ships openly fired on Ukrainian naval vessels in the Black Sea as the latter were on a routine transfer from one Ukrainian port to another. Several Ukrainian sailors were injured and all the personnel on three boats were taken captive and are now being held by Russia completely against international rules. Russia’s attempts to blockade the Azov for Ukrainian ships contradict 2003 bilateral treaty between Ukraine and Russia which declares the Azov Sea an internal sea of the two countries and allows all vessels of both countries, including military ones, the right to freely move across the sea itself and the Kerch Strait that joins it to the Black Sea. What’s more, at the end of September, two Ukrainian naval vessels had already made the same crossing without obstruction. So, from a legal standpoint, Ukraine was not in violation of any treaties or agreements. This is the first incident in more than 4.5 years of war that Ukrainian military were openly attacked by Russian military units. Earlier, it tended to happen through Russian proxies or unmarked Russian military. This open aggression was one of the reasons why Ukraine instituted martial law for 30 days in the 10 oblasts that either border Russia or its enclave in Transnistria, or border either sea. For the first time in its history, Ukraine has declared martial law, a step that signals the seriousness of the situation—and some say that President Poroshenko is also drumming up patriotic spirit among voters in the run-up to the start of the next presidential race. It’s unclear how the conflict over the Azov Sea will unfold, but a lot depends on the response from Washington. First of all, Russia’s actions need to be seen as an act of aggression. Blaming both sides will only give Moscow a green light to keep going. A clear signal to Putin that this kind of action is not going to be tolerated and that new sanctions are in the works would be very good coming from President Trump. A demand that Russia immediately release the seamen it illegally took captive would do a lot to help resolve the crisis. Another point that is very important is that the Trump Administration, unlike President Obama, not hand over the resolution of this situation exclusively to European partners. Shifting the debate to the Normandy format, which Secretary of State Pompeo already mentioned in his statement on the Azov incident, will not work, as Putin made it clear from the start of his war against Ukraine that he was determined to resolve the situation with the American president and no one else. 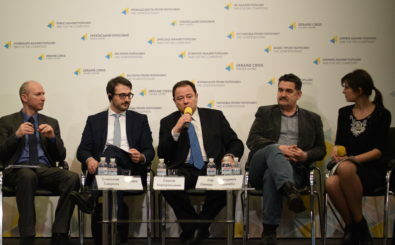 Thirdly, the situation around the Azov Sea was generally aggravated from the moment Crimea was annexed, and then more specifically with the building of the Kerch Bridge to join Crimea to Russia. Given the continuing annexation of Crimea and its rapid militarization, it has to be recognized that as long as the peninsula is annexed by Russia, the risk of escalation in the Azov Sea will be there, as well as the potential for escalation in the Black Sea. Putin’s strategy towards Ukraine has not changed: continuous destabilization at home and continuous discreditation abroad. The Crimea declaration issued last summer by the State Department was an important political signal. However, simply not recognizing the annexation, like the 1940 Welles Declaration, which condemned the soviet annexation of the Baltic states, will make no difference on the ground. The Putin regime should lead to a broader and stronger Welles Declaration, or, more precisely, a Pompeo Declaration, with a clear plan of action for responding to human rights violations in Crimea, for preventing possible consequences of the peninsula’s militarization in the Black Sea region and for partner countries, including NATO allies, and for steps to stop the violation of freedom of movement for vessels in the Kerch Strait and Azov Sea. In the end, the annexation of Crimea, like the war in eastern Ukraine, was made possible because the moment for the right response was missed. The West, including the US, was not prepared to respond decisively itself and asked Ukraine not to do so, either. The Azov incident cannot lead to a repeat of the missed moment. Could the escalation have been calculated to take place just before the American president meets with his Russian counterpart…?